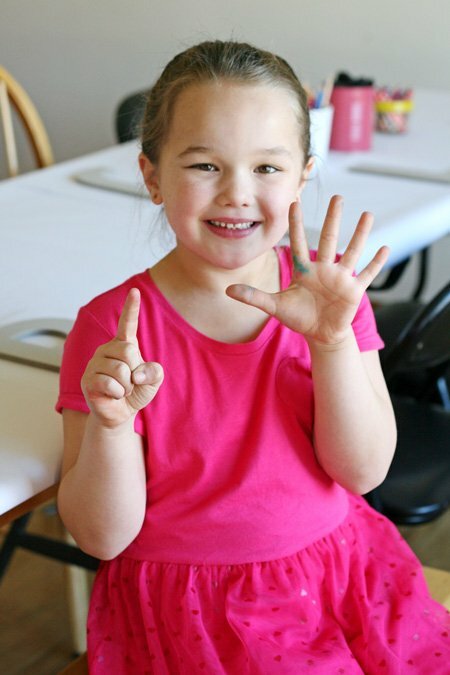 Last month we celebrated my “baby” Joy’s 6th birthday. How does this happen… the little (well, if 9 lbs is little) baby we brought home from the hospital not too long ago is now 6! Joy has always been the perfect name for this fun, rambunctious, confident little girl. She dives into life head first…and has a few stitches to prove it! We celebrated Joy’s birthday with a colorful Arts & Crafts Birthday Party. I chose this theme partly because I knew we’d be inviting both boys and girls, and wanted something fun and interactive that everyone would enjoy. It was a beautiful sunny day, and everyone seemed to have a really great time! I designed the party invitations to fit inside a standard watercolor paint set. Since I knew we’d be hand delivering the invitations, it was a special way to give the guests an idea of the fun we’d be having. I bought the watercolor sets (Wal-Mart is the cheapest place I found), then removed the cardboard Crayola label inside and used that as a template for the invitation. I designed the invitation so that I could fold it in half and the image on one side would show through the box (the “You’re invited… ” part), and the other side (which would be inside the paint box) would include the party details. I added some pretty ribbon and a little name tag for each guest. Along the back of the table, I lined up a row of bud vases with bright gerbera daisies. Chocolate Cupcakes with Vanilla Cream Cheese Frosting, baked in grease-proof polka dot baking cups (called “Color Cups” from Wilton). 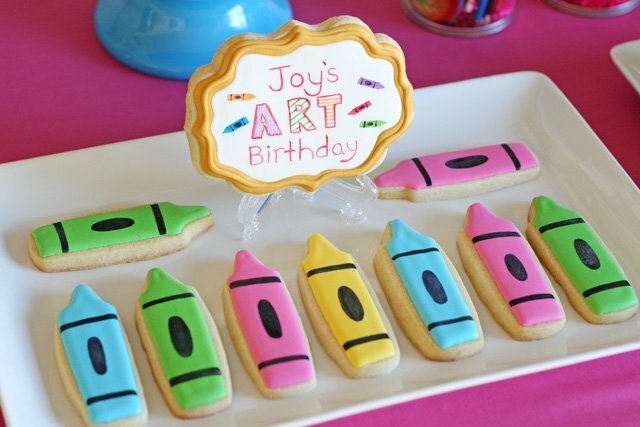 I had fun making simple, yet colorful crayon shaped cookies, and added a special personalized cookie to the tray as well. The personalized cookie was hand-painted, in the same way I recently made some hand-painted Valentine’s cookies. I planned two main crafts for the kids to complete during the party. 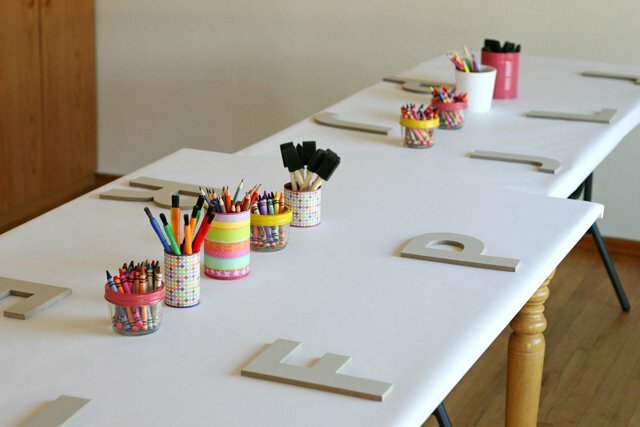 In addition, I covered the entire party table with white paper (from the teacher supply store) and allowed the kids to draw all over the table. The kids were able to color on the table while we waited for all the guests to arrive. 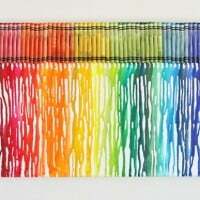 I had jars of crayons and colored pencils (as well as paintbrushes for our other craft) all along the table. 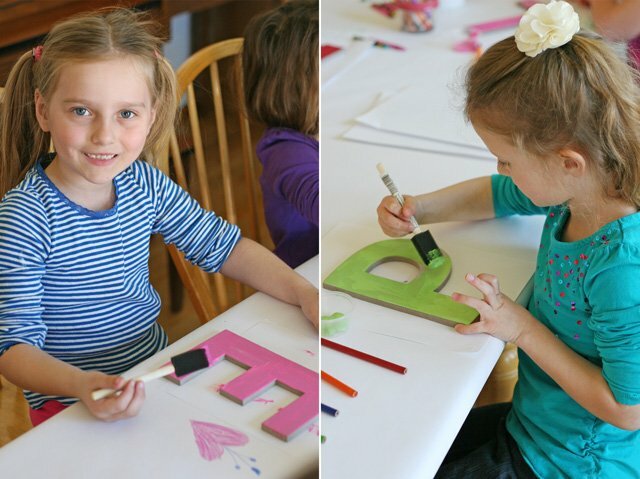 The final craft included the painted initial, on top a mosaic covered canvas. 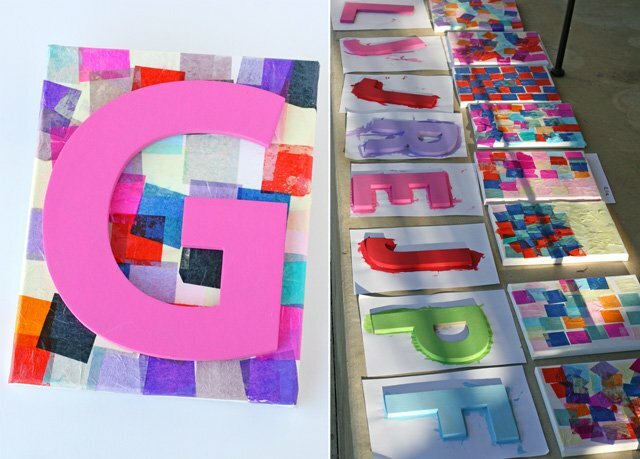 I have a full post on how to make the Personalized Mosaic Canvases. 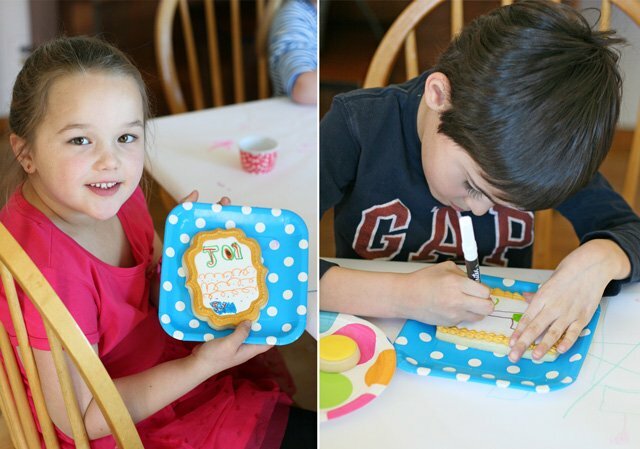 The second party project was for each guest to color their own “cookie canvas” (inspired by The Decorated Cookie). I baked and iced (with royal icing) large cookies in a couple different shapes. I prepared the cookies (and added the frame) just as I did for the Valentine’s cookies I posted HERE. Be sure to allow at least one full day (or more) for the icing to dry before the kids are going to color them. I provided the guests with food color markers, and they had fun being creative! 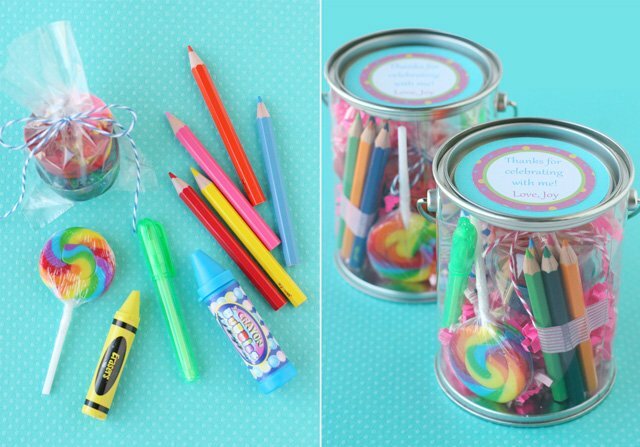 Small paint can pails (available from Oriental Tradding Company, or Michael’s) were filled with mini colored pencils, bubbles in a crayon shaped container, an erasser, a rainbow lollipop (from Party City), and multi color crayon “pods” I made from broken, melted crayons. Joy’s birthday was a fun and creative day, and we really enjoyed sharing it with friends! 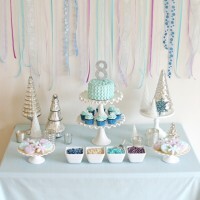 All photos, food, and styling by me/Joy’s mommy/Glorious Treats. I’m with Sarah on being your adopted kid – lol. 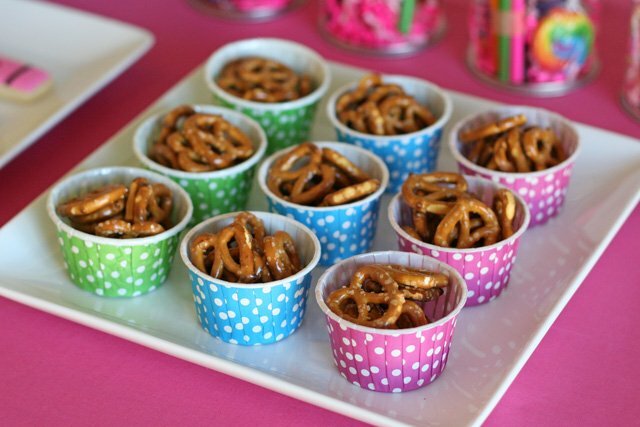 This is truly a unique party idea and I love the party favors. No matter what gathering I have at my house there’s always favors to take home I also loved, loved, loved (oh did I mention LOVED) Joy’s ladybug party theme. I too am an enthusiastic ladybug fan (ladybug key chain, jewelry, email address, vanity plate, birthday cakes, flip-flops, sun hat, Swarofski collectable, ceramics, stuffed animal, thank you notes, egg timer, trinket box, Halloween costume . . . you name it and I’ve got something ladybug”ish”). I’m hosting a girls night (yes we’re girls even at 50 years of age – lol) in April and I’m thinking ladybug theme just for kicks. Many thanks for such beautiful painting and so original cakes as “Stabilo Boss” brushes. I regret to be at work from monday to friday instead of being at home enjoying myself with such very good ideas. Just stumbled across your blog. WOWZA – you are so talented and inspire me. I’m so not the crafty mom but I enjoy others gifts and sometimes ‘try’ my hand at something new. You’ve made this party look like so much fun and relatively easy. Thank you. Oh also, where did you purchase those lovely turquoise cake pedestals? I’m in love. I bought the cake stands off Ebay, they are by the Mosser glass company. If you search “blue cake stands” on Ebay, you will likely be able to find them from time to time. I have followed your beautiful work for a while now. I was totally surprised when I recognized your previously published pictures of Joy’s Birthday on another blog. I did not see any listing of your blog”s name. 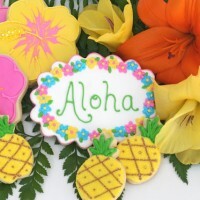 Check out the following; http://anasapeka.blogspot.com/ . Thanks for letting me know. I just let a comment on the post, but I’m not sure if the person posting my work will be able to read my comment in english. You are a very talented woman. I wish I could do this full time. Your ideas are very creative and I love checking in from time to time to “borrow” them. The kids are so lucky and the decorations are so pretty. Wow, what a great and creative idea. I love what you have done with the theme. It is great when kids get the chance to be creative. All I have is the exact invitations pictured. I made them by measuring the paper that comes in the watercolor box, and worked off those dimmensions (using Photoshop). Everything on your website is so beautiful! 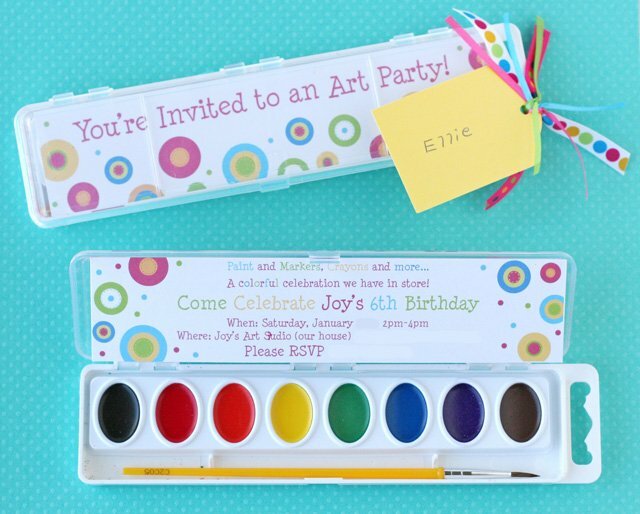 Would you be willing to share the template for your Art Party invitation, minus your personal information, of course? If not, no worries, just thought it was brilliant and possibly beyond my technological capabilities. 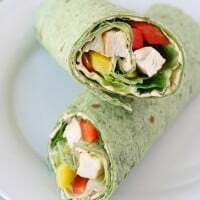 Thank you for the wonderful recipes, ideas, and inspiration. Such an amazing idea thank u soooo much. Planning to do it for my son’s birthday. Wow! I was just shopping around for some ideas and found your blog. Everything looked gorgeous, and totally inspired me! The kids looked like they were having a fantastic time. 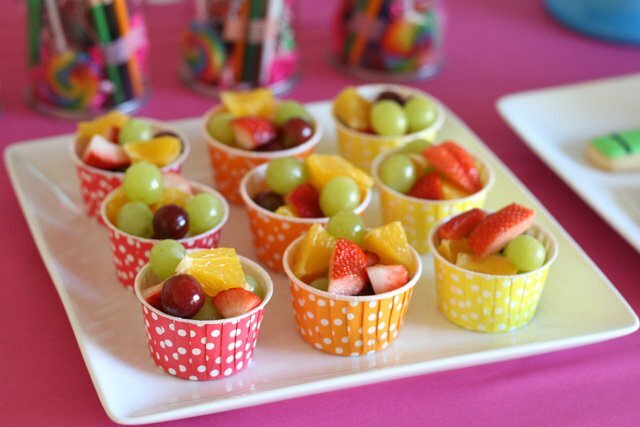 This is such a great idea, however, the candy cups are very small! I couldn’t fit more than a handful of pretzels or a few pieces of fruit and the kids ended up taking three cups each! Luckily I allowed for this after I saw how small they were. 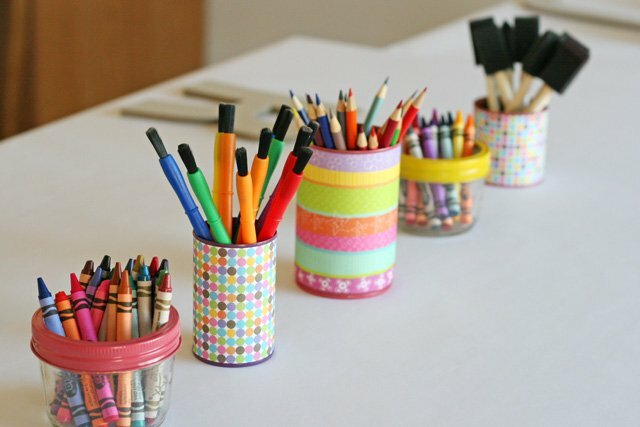 I think next time I will use pretty paper cups instead! What a FAB party!!! Definitely gonna try dis things! 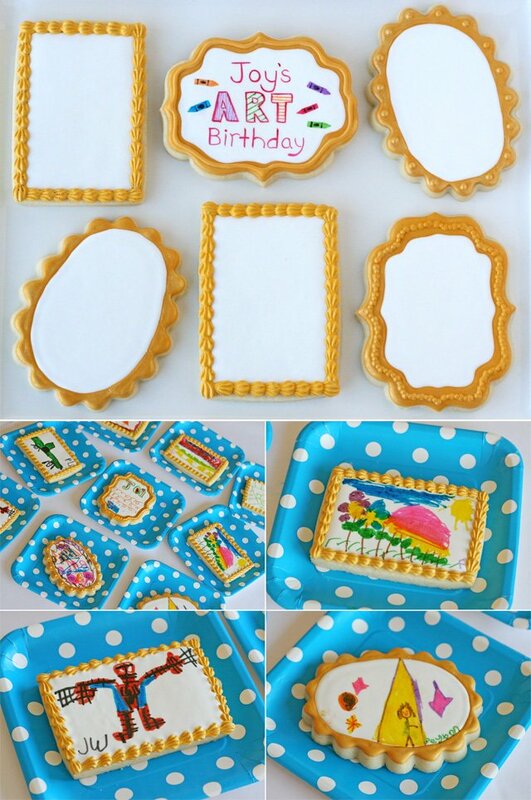 I just came across you blog and absolutely love this birthday idea! I especially love the personalized invitations you created. Would you be willing to share the photoshop file for me to use for my daughters 5th birthday? I completely understand if you would rather not share it. Thanks for documenting all the details, it was very helpful to read where you found items, etc. Hi Anne, I only have the final file personalized with our party details, so I don’t think you want that. Glad you found some inspiration from our party, have a great party! 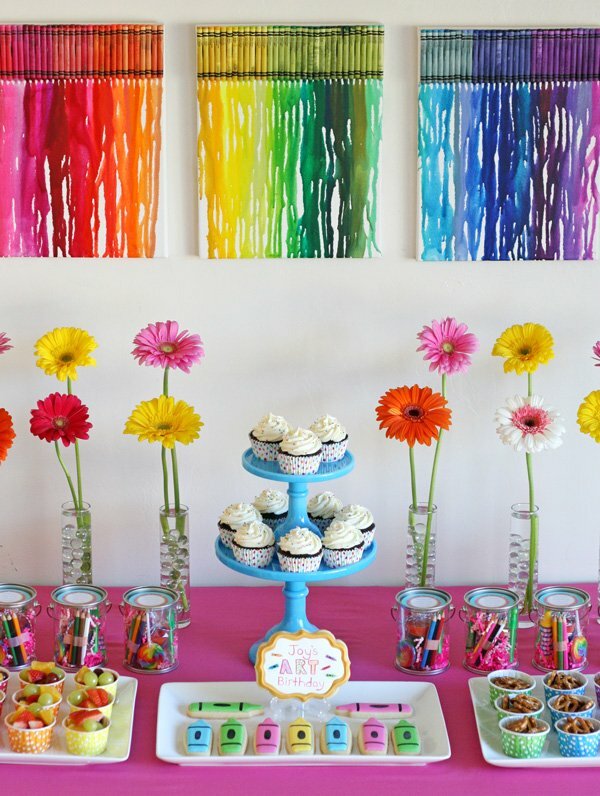 What a colorful and beautiful party! Happy to have stumbled across your blog this morning. Love all of your ideas. My daughter just requested a painting party for her 4th birthday. I’m working on copying/stealing your invite idea- just bought the watercolors from Walmart. ;-). Thanks for all your cute ideas. So far the kiddos are decorating their own painting aprons with foam stickers and stamps, then will be painting initial letters, playing some games with the Gymboree instructors, then coming back to decorate some birthday cupcakes. Thanks again for the super cute and fun ideas! Its fabulous.. can you suggest on how to make those custom invitations. I saw your custom water bottle labels and would like to know on how to make those custom labels. would you share your psd files for the watercolor insert invites? I was wondering how did you do the template for the invitation? I have the watercolors but I’m unsure how to do the measurements and how to create overall. How many can be handled well in this themed party? I imagine the number of kids is mainly only limited by the space you have. Certainly the ages of the children will greatly vary how many helpers you may need to keep things moving along. This party was in my home and most of the parents stayed and helped their children with the projects at least a bit.